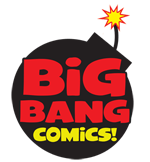 When Chris Ecker and I first created Big Bang Comics about twenty years ago, some of our earliest champions were Golden Age comics legends Mart Nodell and Shelly Moldoff. Both were kind enough to provide covers for our early issues and appreciated the homages that we were creating. My wife Margie attended most comic conventions with me and we always enjoyed spending time before the day’s activities visiting and catching up with Shelly and his wife Shirley. Chris was friends with Mart and Carrie Nodell and I got to know those wonderful folks through him. Carrie Nodell was a wonderful, sweet lady and she always referred to us and Big Bang Comics as simply “The Bang” and Chris and I started to refer to the project that way and still do after all these years. When I decided to start a blog featuring unpublished art and stories from Big Bang and Megaton, I never had any doubt as to what to call it. Mart and Carrie and Shelley and Shirley are all gone now and I miss seeing them at comic shows. As an “old guy” now 20+ years on, I have even more respect for how hard they worked at those shows and for the fun and enthusiasm they generated. This blog is dedicated to their memory and spirit. What can you expect from this blog? I’d like it to be a companion to my two websites: www.megatoncomics.com and www.bigbangcomics.com . If you’re not familiar with them or my work you might want to check them out. Over the years there’s been a lot of work that didn’t make it into the books, and I’ll be sharing some of it here. Sketches, covers, complete comic stories, character designs, even scripts. I’d like to encourage any of the artists and writers who were part of the gang over the years to comment, submit art and/or their recollections about the good old days (or not so good, if that’s the case). Hopefully they will not mind me sharing some of their old work here.